IObit Toolbox is FREE portable software that system administrators and computer geeks will take along to solve PC problems anytime and anywhere. 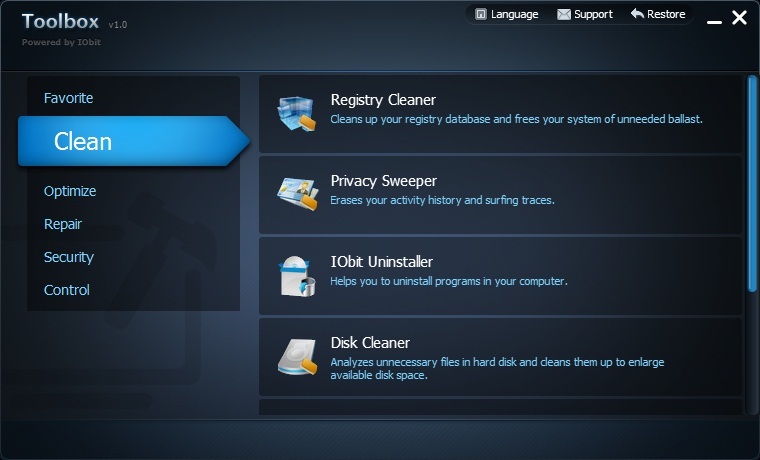 With more than 20 dedicated tools,IObit Toolbox allows you to display/diagnose PC information, enhance PC security, optimize PC performance and repairing PC problems.IObit Toolbox is like a Swiss army knife, with more than 20 computer tools in one place, you have more than 20 powers to diagnose and fix PC problems, including cleaning, optimizing, repairing, security and fully control. IObit toolbox requires 0 installation. You can take it along with you in any portable devices, like flash disk, to solve PC problems anytime and anywhere. Also it eats little room in your disk. Each admin tool in IObit Toolbox is stand-alone and powerful. They are capable of handling different tasks perfectly. Of course, they are organized professionally and very easy-to-use. Tools like IObit Toolbox can cost you $200 or more! You no longer need to search on the internet and do the collection yourself, you don\'t need to pay! In IObit Toolbox you will find computer tools you want for free. You can make yourself an own toolbox with your company brand, all we requireis to leave the "powered by IObit" part. In a word, it offers an easy way for PC admin to monitor and manage computers. IObit Toolbox can be used for both commercial and non-commercial purposes.